This was my second look at it. After the first time, I got quite excited because I could see how wide the 2nd row was. Honda provides 3 LATCH attachments in the 2nd row in addition to one more in the 3rd row. This is more than most vehicles of this size. I was also excited because on YouTube I found more information about the storage area behind the 3rd row. What the Pilot offers us over our Odyssey is 8-passenger capacity and 4WD. Because we live near the top of a mountain above the snow line, this past winter we found that we had trouble getting into our driveway even with 4 winter tires on our Odyssey. Just like the 2008 Toyota Sequoia, there is a nice space behind the 3rd row that is wide enough for our Peg Perego Pliko P3 stroller. Also just like the Sequoia, there is a cover over a recessed area that you can remove to fit taller items. 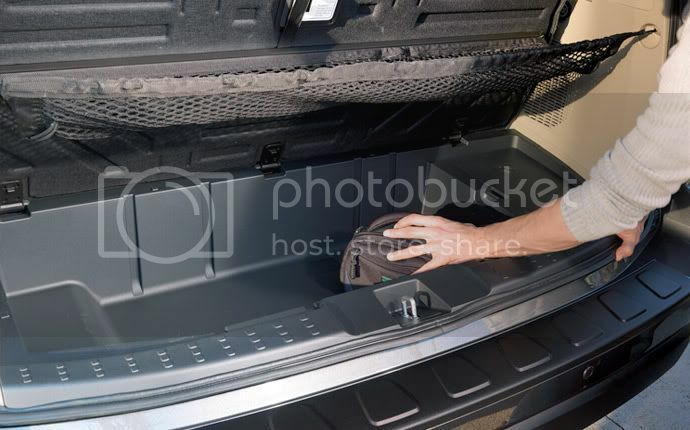 In the case of the Pilot, this recessed area is deeper than the Sequoia and Honda has incorporated a hanging net that can be used as a 2nd tier storage area. I really like this efficient use of space. In the videos I saw this space was large enough to put a cooler and extra bags and folding chairs--perfect for a family picnic! Now the seating area is not as roomy as the Sequoia, but it also isn't as massively huge. Parked next to the Odyssey, the Pilot's hood and roof lines were obviously higher, but the length seemed almost the same. It seems to be a good compromise. We put our two Britax Parkway booster seats in the 3rd row and it looked to be about as wide as our Odyssey. Also, being a Honda, the Pilot Touring has things that we are familiar with and appreciate very much on our Odyssey like the navigation and rear-entertainment system. An advantage of the Pilot is that you don't need to get the navigation system in order to have a rear back-up camera. Without the nav system, the rear camera is displayed in a small 2" screen in built into the rear view mirror whenever the vehicle is put into reverse. While in drive, the screen magically disappears and you have your full rear-view mirror again. Unfortunately, I found it hard to see things in this tiny screen and much prefer the rear camera being displayed on the large Nav system screen. 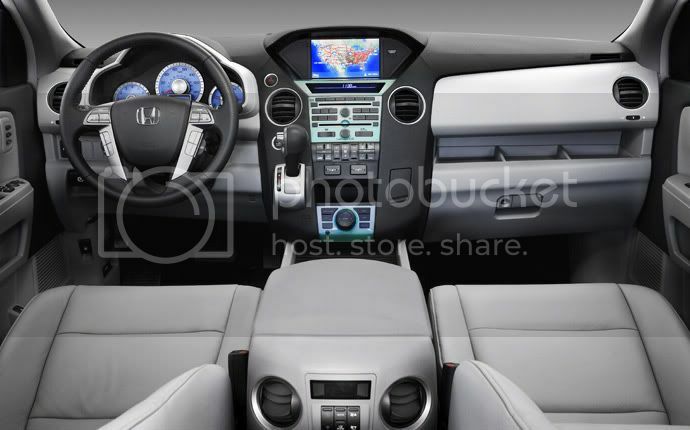 It would not be a problem for us because the Touring trim comes with the Nav system standard. There are some other nice touches in the interior including a hood to shade the navigation screen (which is missing in the Ody) and storage above the glove box for the passenger to place items like cell phones and pens, etc. I didn't get very long behind the wheel, but from what I could tell the 2009 Pilot handled just as well as our Odyssey. Like the Odyssey, it is a large heavy vehicle that is designed to be practical. It would have been nice if it could be a little sporty, too. Somehow I don't think the 250 HP engine is going to be up to the task without some serious peddle mashing--not like that's ever stopped me before! I like the look of the Pilot... 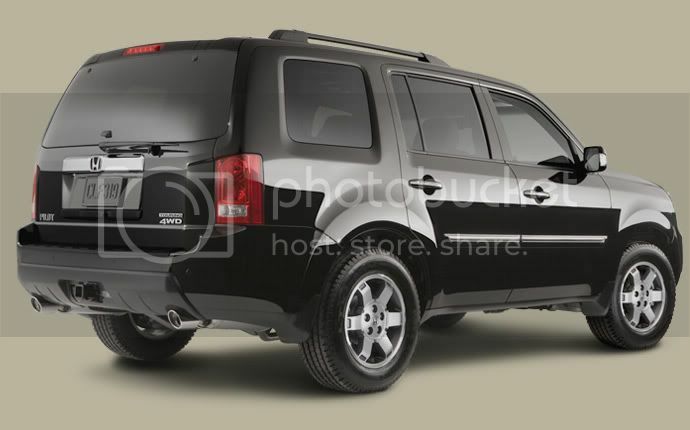 It reminds me of the Fj (slightly) and the newer Jeep Liberty as far the design evolution goes. Awesome cockpit/dashboard !